My Loom Is Warped. Now What? with a decorative, yet supple join. 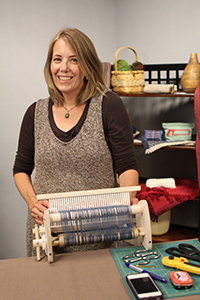 Years ago, when I turned in the first draft of the manuscript for Weaving Made Easy, my editor Ann Budd tapped me on the shoulder and said I had forgotten something. “Oh,” I enthusiastically replied. “What is it? I'll get right on it.” She then let me know that I didn't tell the readers how to weave. How is it possible that I wrote an entire book about weaving and didn't tell the reader how to weave? It is true, I didn't. I wrote about warping, project planning, problem solving, but not one word about lifting and lowering the rigid heddle. 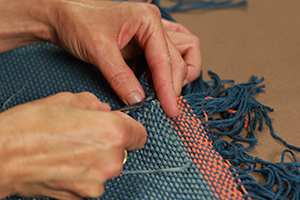 In weaving, we spend a lot of time trying to master the technique of warping, but how much time do we devote to the art of weaving? How do we create really great cloth that turns out the way we expect and performs the way we want? How do we recover from the mistakes that will inevitably happen? warped loom to a pieced blanket. While in the development stages of my company, Yarnworker, I surveyed over 350 rigid-heddle weavers. I asked if they had a magic wish to make their weaving lives better. The number one answer was time. The second most popular answer was getting unstuck. I can't grant weavers more time, but I can help increase a weaver's skill level to keep her from wasting the precious time she has to devote to weaving. My first workshop video, Slots and Holes, showed three quick ways to warp a rigid-heddle loom, a definite help with time. Now Life After Warping covers a wide range of weaving techniques, skill building, and tips and tricks that will make your weaving time happier and more productive. We start with a warped loom and follow all the steps it takes to make a pieced blanket. Along the way we learn why headers matter, how to spot tension problems, shuttle managements, and a host of other techniques to make your weaving life better. So thanks, Ann Budd. Mission accomplished.